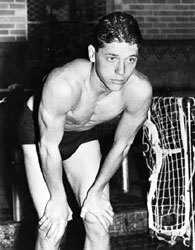 Beverly Hills High School and USC watersports star Wally Wolf was a four-time U.S. Olympian, competing in 1948, 1952 on the U.S. swim team, and 1956 and 1960 on the U.S. water polo team. He was selected for the 1964 Olympic team but could not accept. In 1948, the first Games following World War II, 17-year old Wolf swam the second leg of the gold medal and world record-breaking USA 4x200m relay team. At Beverly High, he won the CIF 220y-freestyle championship three years running, 1945-47, and was the CIF record holder in 220y-freestyle and individual medley. As a USC undergrad, Wolf was a swimming and/or water polo All-America 1949, 1950, 1951. He was one of the inaugural honorees elected to the Water Polo Hall of Fame in 1976. A graduate of USC Law School, Wolf practiced law and was a theatrical and motion picture agent for 40 years. He served on the 1984 Los Angeles Olympic Organizing Committee. In died in March 1997. Wally’s older brother, Rube Wolf, Jr. preceded him as a USC All-America swimmer in 1943, 1944, 1946-48. Their father was prominent 1920s-1940s vaudeville musical director Rube Wolf.